The latest on the spot-fixing scandal raised a few questions in my mind, none of which were remotely ethical. I make a pointed reference to the question of ethics here to counter the arguments about tanking one’s performance in sport. An eminent cricket commentator was trolled on Twitter for suggesting that ‘spot-fixing’ was different from ‘match-fixing’. He appeared on television later in the day to clarify that both amounted to cheating, albeit of varying quantum. Now! I find this irritating. I mean how can I be a small cheat or a big cheat? Isn’t it like being a little pregnant or a little mad? Now seriously, can one qualitatively analyze the depth of moral turpitude? A 50-rupee currency note passed to the traffic cop to evade a parking ticket and a 10-lakh rupee capitation fee paid to admit my son to medical school are both acts of bribery. Now, bring in the millions that a politician grabs for doling out special favors. Does the picture really change? Or do we merely accept the first two because the outcome is directly related to us while the latter involves a larger constituency and we cannot directly be held responsible. Anyway, the questions that cropped up in my mind related to sporting ability and less with morality. Why would a sportsperson bet on underperformance? Does it mean that they have come to accept that their best effort wouldn’t get them on par with competition? Have they already given up hope of achieving stardom? Is the risk of being branded a cheat less painful compared to fading away without fulfilling their aspirations? How do these sportspersons compare with the other category of ‘cheats’ who do drugs to over-perform? Finally, have sportsmen overturned the chronology of ‘name, fame and fortune’ by chasing the last named first? I do not have answers to the questions above, but what I did realize during the 24 hours of media madness is that everyone was either shocked or appalled. Everyone, including myself, felt cheated by the players who fixed an over or two during a match, without actually affecting the outcome of the game itself. The self-righteousness with which each of us went after the players was indeed intriguing. Haven’t we colluded to such corruption ourselves? When a cop asks for money in lieu of a parking ticket, we readily acquiesce as we do not want to spend time at a court paying up fine. Looks like the players too didn’t want to wait their time and outperform others of their ilk and chose the short-cut of underperforming and making more money. 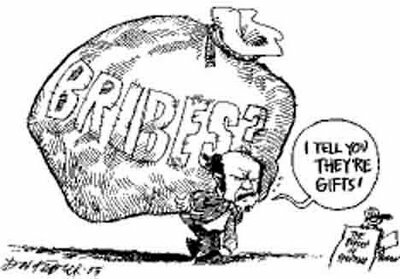 Is that morally wrong in a country where we do not think twice before giving or taking bribe.